White crappies are very similar in appearance to black crappies. They have 5–10 vertical bars along their body, rather than the randomly scattered spots like the black crappie. It has a silvery color with green or brown shades along its back, with dark lateral bars along its side and a white belly. The dorsal fin of the white crappie starts further back on the body than that of the black crappie. White crappies are also slightly more elongated than black crappie. The species is a deep-bodied fish with a flattened body. It has spinous rays and ctenoid scales. Both species of crappie have a terminal mouth with many small conical teeth. The teeth occur in two rows along the mouth and are called cardiform, because they resemble a tool used for wool carding. 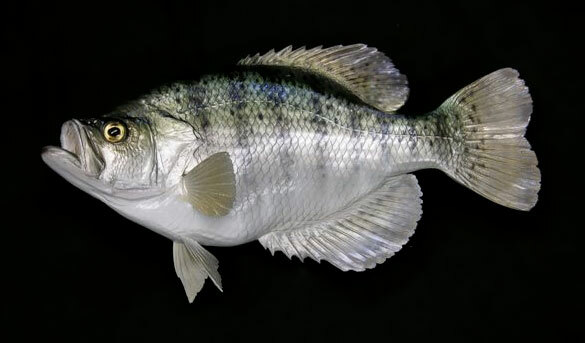 White crappie belongs to the Infraclass Teleostei, which is one of three infraclasses in the class Actinopterygii. White crappie rarely exceed two pounds and live around 2–7 years. The current all-tackle fishing world record for a white crappie is 2.35 kilograms (5.2 lb).